Rendering of new $12.6 million CCHS facility. TUSCALOOSA, Ala. – On Sunday, Nov. 24, at 3 p.m., The University of Alabama College of Community Health Sciences, which is part of The University of Alabama School of Medicine (UASOM), will host a groundbreaking ceremony for their new $12.6 million facility. The new building site will be on the corner of Fifth Avenue East and University Boulevard. Dr. William Curry, a physician and the dean of CCHS, says the new 77,000 square-foot facility will help consolidate CCHS faculty, students and services into one building from the four they currently occupy. CCHS has the lead responsibility for rural health teaching, research and service in rural Alabama. In fact, one in seven practicing Alabama family physicians comes from The University of Alabama’s residency program. The new building will have a state of the art medical information system. The paperless system makes it easier to improve education and clinical efficiency while providing the best possible care to patients. Curry said the students and residents involved in CCHS’s program will have had experience in the medical office of the future, which will be essential during their years of medical practice. CCHS hopes to combat that image with better ways of managing information, reducing costs and linking educational resources to the doctor-patient visit. UA’s program is the first in the state to take such a comprehensive approach. 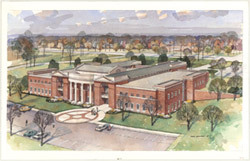 The centralization that the new facility will provide will promote the continued growth and success of the clinical programs, allow students and patients easier access, and provide resources for expanded collaboration with other colleges within the University, such as the Culverhouse College of Commerce and Business Administration, the Capstone College of Nursing and the School of Social Work. This year also marks the 30th anniversary of CCHS on the UA campus. Since the college was founded in 1972, vast changes have taken place in the practice of medicine, in hospitals, in the health insurance and pharmaceutical industries and in the whole array of medical and health services providers. The college has made significant strides in making health care more available and accessible across the state of Alabama. More than 450 physicians have received their third- and fourth-year clinical training at CCHS. Of those graduates, 52 percent have chosen careers in primary care. In addition, 290 family practitioners have completed their three-year residency training here, and many are serving throughout Alabama’s small towns and cities. During the past 30 years, CCHS has contributed greatly to improved health care in the state. As the college embarks on its fourth decade, it will continue to address the unique problems associated with rural health care in Alabama by training skilled medical practitioners for the future. The Lister Hill Society will hold their annual fundraising event immediately following the groundbreaking ceremony. The group provides annual fund monies to support medical education at CCHS. This year’s event also will celebrate the 30th anniversary of the college. For information on how you can give to the building fund, contact CCHS at 205/348-0093. CCHS is one of three clinical campuses of the UASOM in Birmingham, a nationally ranked medical center established in 1945.